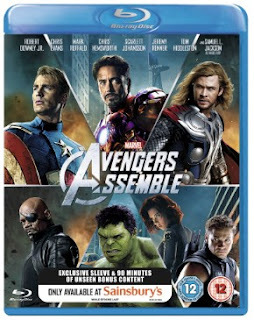 Just read that there is no Joss Whedon Commentary on the Avengers Assemble UK Blu-ray / DVD! Man, am I getting annoyed with this! Another high-end summer blockbuster being released in the UK with little to no special features, compared to the US version which gets loads. To make things even more frustrating, there won’t be a Blu-ray / DVD combo pack (which every other Marvel release has seen) in the UK. There is some hope however, if you order from Sainsbury’s in the UK the version they’re selling contains an exclusive 90minute “making of” and I’m assuming (or praying) that this is the same “Assembling the Ultimate Team” feature included in the US version. But I really don’t get this, big blockbuster movies used to always come with lots of extras as a standard. For me the primary motivation for buying the Blu-ray is for the special features and the behind the scenes featurettes. I’m assuming this would be fairly obvious from an added incentive and a sales perspective as well. So why the releases in the last few years have slowly been including less extra content is a surprise to me! In The Avengers case it’s not like it hasn’t been produced in the first place as it’s included on other versions! I can’t imagine this helps with piracy either, if people download a film illegally they generally only get the film. At least if you purchased the film legally you used to get a load of bonus features. But now if you purchase the film you’re beginning just to get the film, which isn’t going to encourage people to start buying the product legally if they’re not already. I would have thought it would have been movie studios interest to have extra content and encourage people to purchase their films! Of course, The Avengers is the first film to be distributed by Disney (rather than Paramount) and they are notorious at stripping back UK home releases! A similar thing happened for Pirates 4… But Disney aren’t the only people to do this Paramount themselves have stripped back recent UK releases as well, including Transformers 3 and Mission Impossible:Ghost Protocol. So looks like this is a problem within the UK market rather than Blu-ray’s in general, but I’m not happy about it! Interesting... what are the odds we get a re-release at some point around Christmas as another money making scheme to rob fans? I'm one of the people who actually likes to watch the bonus features & am wondering why the UK is getting less of them these days. If some lovely American were to upload the missing features onto YouTube (if they aren't there already) then I'd be a bit happier.